In most of the businesses we work with, a “Marketing Department” is simply nonexistent. When there’s a person (or persons) whose “job” is marketing, the reality is that they wear multiple hats. Think about your business for a moment: who is responsible for marketing? …then chances are your business isn’t staying on top of the rapidly changing world of marketing. will suffer to some degree or another. If this sounds familiar, then The Growth Show is for you. Why Create Another Marketing Podcast? In my brief (and admittedly not entirely scientific) survey of the landscape, I found that most marketing podcasts are for marketers. 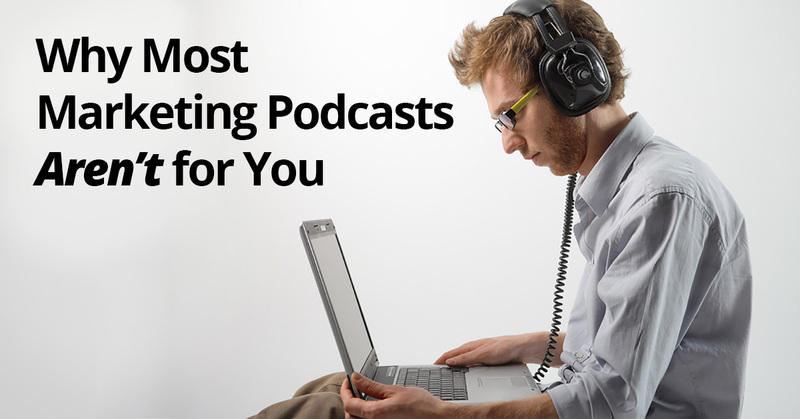 If you’re already spending all of your time in the world of PR, content marketing, social media, search engines, and the like, then it’s really easy to find great podcasts that will keep you razor-sharp at the bleeding edge of the latest and greatest. If you like hearing experts discuss the finest nuances and details of the latest tools and tricks, then it’s no problem to find them doing that every day, all day. But if you’re in a business like the ones I described earlier, then those marketing podcasts just aren’t for you. The learning curve is steep. Your time is valuable. And you don’t want to waste it hearing about stuff you’re never going to actually do. And that’s why we created The Growth Show. My good friend, Rod Thomson, and my newer friend, Josh Muccio, have a lot of expertise and knowledge to share. Rod is a veteran journalist who has written for major publications and has worked as a reporter, columnist, and editor. Josh built an entire business based upon Google search traffic and e-commerce, which ended up with a successful retail location and a local presence. Having now sold that business, he’s a young entrepreneur with a track record for success and a lot of knowledge about what works and what doesn’t — especially for local search. Together, we believe that we can help a good many businesses who don’t have a marketing department… or even a dedicated marketing staff member, for that matter. Visit thegrowthshow.com to check out the first episode. It went live last Friday. It’s our first one, so we’re still getting comfortable with the format and with how we work together, but I think you’ll find that it might just be the very first marketing podcast that’s just right for you.